The top two bidders below will each receive a critique of a short story or 10,000 words of a longer piece from writer Arkady Martine. Starting bid: $70. Arkady Martine is a speculative fiction writer and, as Dr. AnnaLinden Weller, a historian of the Byzantine Empire. Under both names, she writes about border politics, rhetoric, propaganda, and the edges of the world. Arkady grew up in New York City and, after some time in Turkey, Canada, and Sweden, lives in Baltimore with her wife, the author Vivian Shaw. 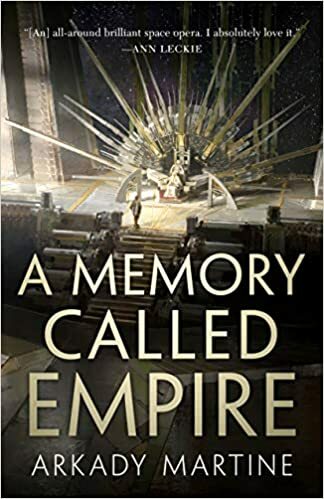 She is the author of A Memory Called Empire. I’ll make an opening bid of $70. Dear Terry, I have not yet received a reply to the email confirming your win of one of the critiques. Please get in touch with me here or at mayachhabra AT gmail DOT com as soon as possible. Yes, that’s fine. I’d like to critique two short pieces. How do I proceed? Email them to you? This is a reminder to send in proof of your donation to PCRF if you would like the Arkady Martine critique. Dear Sarah, I have not yet received a reply to the email confirming your win of one of the critiques. Please get in touch with me here or at mayachhabra AT gmail DOT com as soon as possible.